Super Evil Megacorp’s Vainglory has officially launched on iOS devices, bringing a free-to-play multiplayer online battle arena (MOBA) experience to players on iPad 2+ and iPhone 5S+. The game offers 3-vs-3 team battles, as players compete to destroy a giant crystal, called the Vain, in the enemy team’s base. 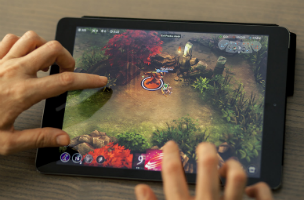 The game was created by developers with experience at Riot, Blizzard, Rockstar and more, and takes advantage of Apple’s Metal SDK to offer an experience similar to what users would find on consoles. Users can begin Vainglory by completing the tutorial match to get up to speed. Completing the Initiation and/or Ringo Gold Rush tutorials will unlock the rest of the game’s modes for players, which include solo play for practicing one’s skills, party play with friends and quick match against random opponents. To start, players have access to up to ten heroes (each with their own abilities), but more will be added to the game in future updates. A few of these heroes are free-to-play, while the rest are unlocked using currency, including ICE, the game’s premium currency. At the beginning of each match, players can purchase items and select one of their hero’s abilities to unlock. As a hero levels up, it will gain access to more abilities, or players can choose to strengthen existing ones. During gameplay, players have the main goal of attacking the enemy’s base and Vain crystal, but they can also capture strategic locations across the map for extra power. A minion mine, for instance, contains NPC enemies to defeat, but once captured, makes the team’s minions stronger for the rest of the battle. If players aren’t interested in these locations (or teammates are taking care of them themselves), users can run down the main lane, taking out enemy turrets on a direct path to the enemy base. Worker minions are spawned automatically, and will walk down this lane, also attacking turrets and enemies in the path. Injured players can hide in tall grass to avoid being spotted, or can teleport back to base to heal for free. If players die during combat, they’ll need to wait a few seconds to respawn, but can purchase items in the shop while they’re waiting. After a battle, players can add friends from the end-of-game scoreboard. Users can also invite players directly by name. A hefty academy system offers videos for recapping the game’s rules and elements (outside of the base tutorial mode), and users can view an in-app news feed for information about the game’s livestreams, in-game events and more. Vainglory is available to download for free on the iTunes App Store. Check out our interview with Kristian Segerstrale, COO & executive director at Super Evil Megacorp, for more on the game.